How could you not want to visit an Island that gets on average, 300 days of sunshine a year? 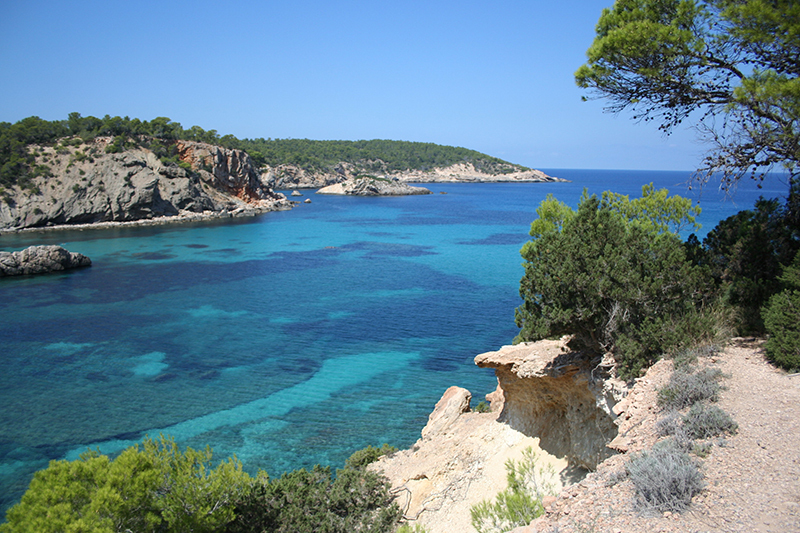 Ibiza is a brilliant spot for both party lovers and relaxing holiday enthusiasts alike. Although it is renowned for having the best nightclubs in the world and being the home of the cream of European DJS (Carl Cox, Sven Väth, Luciano, Dimitri Vegas & Like Mike etc.) Ibiza has more than partying to offer. With its beautiful coastline, golden beaches and some of the best sunsets we have ever seen Ibiza is an Island that should be explored. If its sun you want Ibiza is at its warmest June-August time although in around June and September time is when its slightly cooler and not only will you get a better deal but you will be missing the crowds. Off Season can still be enjoyable but quite and relaxing in around march, October time. 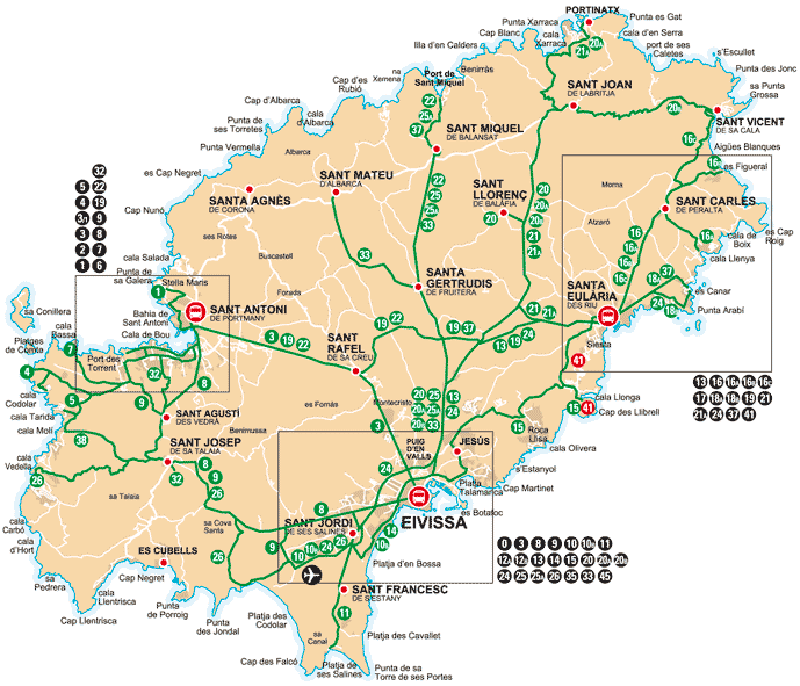 Getting around Ibiza is very simplistic as it is quite a small Island, the main transportation around the Island is the bus network costing around €1.75- €2 running from 7am – 11:30pm during summer and after dark the disco buses run through the night. Also taxis are a very common way to get around Ibiza and are priced by the meter. The summer season and the first really warm beach days begin in May, with beautiful clear, sunny days and temperatures in the mid-twenties. Between the months of June and September, there is very little rain fall. In August and September the temperature rises to over 30º C. With water temperatures of 27º C.
Ibiza clubs can cost up to €50 for entry so plan your nights out to the big clubs and pre-book your tickets online. Also when visiting the big clubs drink prices can cost up to €15 for a vodka coke so be sure to check out the many cheap bars before hand to save you €€€. The narrow and well-preserved alleys and streets of this old town are an outstanding example of a fortified citadel. 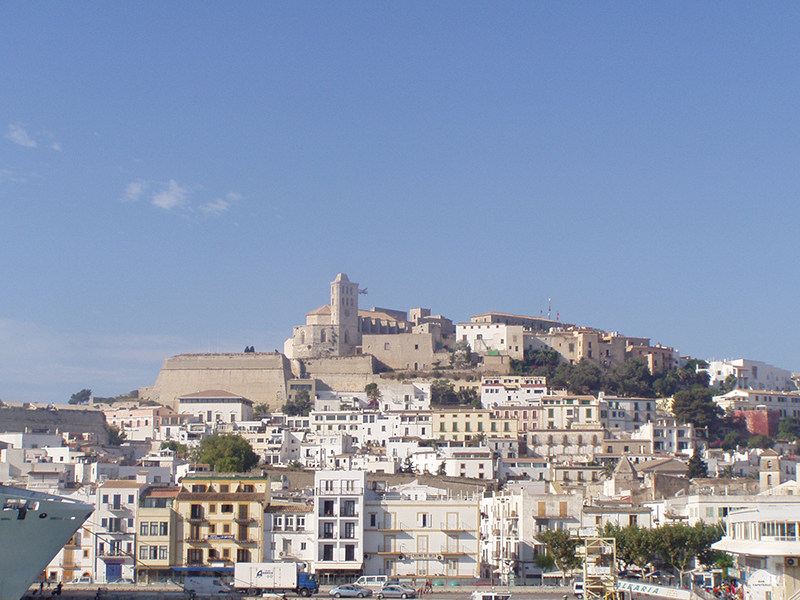 The walled 16th-century Old Town crowns Ibiza Town. It offers charming selections of shops and restaurants, museums, Santa Maria Cathedral and one of the best views on the island. Opening Times: Daily 24 hours. Like a time warp back to the 1970s, this market has an enormous variety of exotic hippy clothing, tailor-made leather items and East Asian silver jewellery. It’s held every Wednesday on the grounds of Club Punta Arabi, Es Canar and every Saturday in San Carlos (Las Dalias). Opening Times: Wednesday April-October 10am -6pm/ Saturday may-october 10am-8pm. Standing at almost 400 metres high, this uninhabited rock island made of limestone is situated 2km off the west coast of Ibiza, in the Cala d'Hort area. Steeped in legends, it is reputedly the tip of the sunken city of Atlantis. 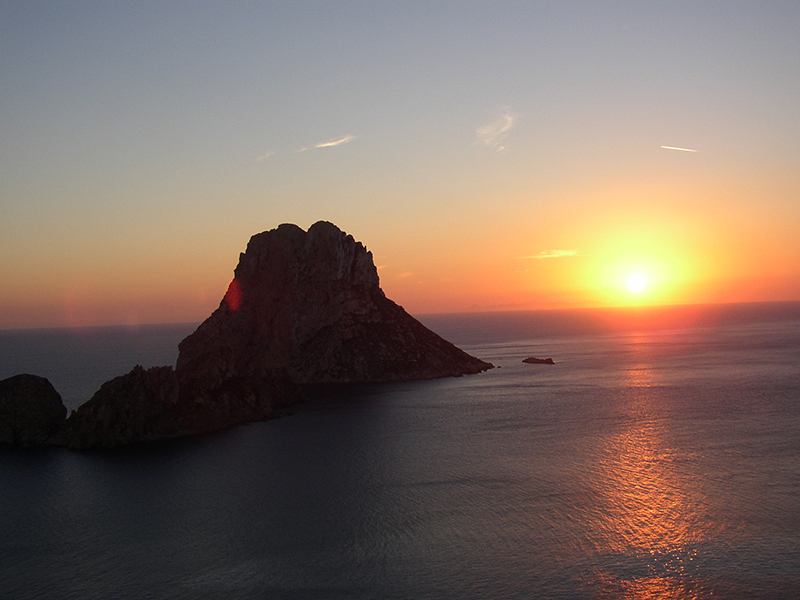 Head up to the lookout point of Torre des Savinar (the old pirate watchtower) for a truly breathtaking sunset view. Portinatx is on the northern-most tip of Ibiza. This small, pretty resort is known for the crystal clear waters of its two bays (ideal for snorkelling) as well as some lovely coastal hiking along the cliff tops. This is one of the local's favourite beaches on the southern tip of the island. 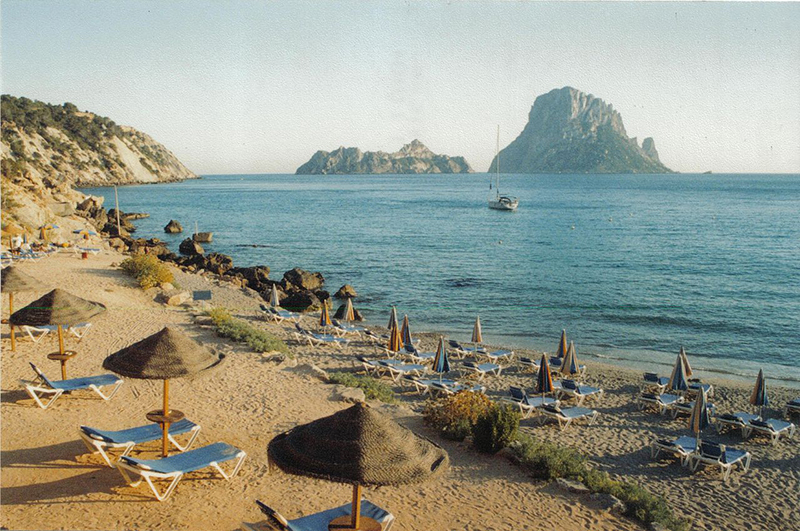 It's by no means large, but the atmosphere is relaxed and the view of the dramatic Es Vedra rock rising out of the sea is magnificent. This is also one of the most magnetic points on the planet. One of the most beautiful sites to see in Ibiza is the sunset and the San Antonio Sunset Strip is one of the best locations to see it. Weather you choose to sit in Cafe Del Mar or Cafe Mambo to watch the sunset or you choose to grab a couple of beers from the shop and sit on the rocks enjoying it for free, it is a magical experience and is one that shouldn’t be missed. Sunset times change by date so check times before you arrive. The ultimate Burger joint in Ibiza to cure those daily hangovers or perfect for a quick meal on the way to one of the super clubs such as Space. 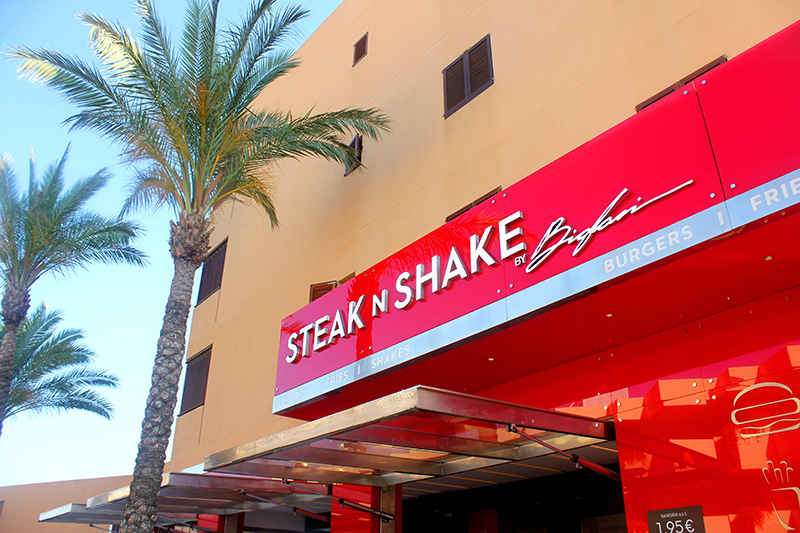 Serving burgers, fries and some of the best milkshakes in Europe, Steak ’N Shake is the perfect fast food restaurant without the fast food taste. The little hidden gem in Ibiza that serves not only the perfect proper English breakfast but perfectly priced tapas with a friendly smile. 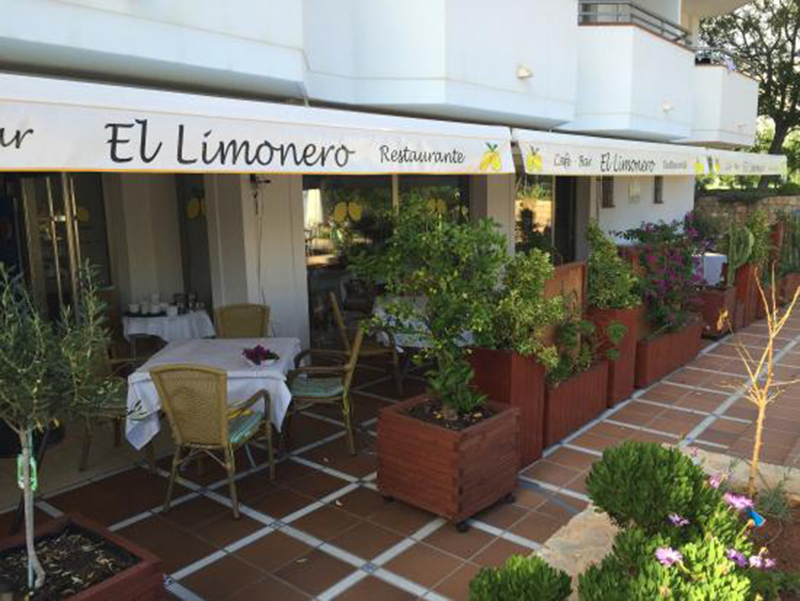 Situated beside Sankeys Ibiza, this family run restaurant is one to check out. 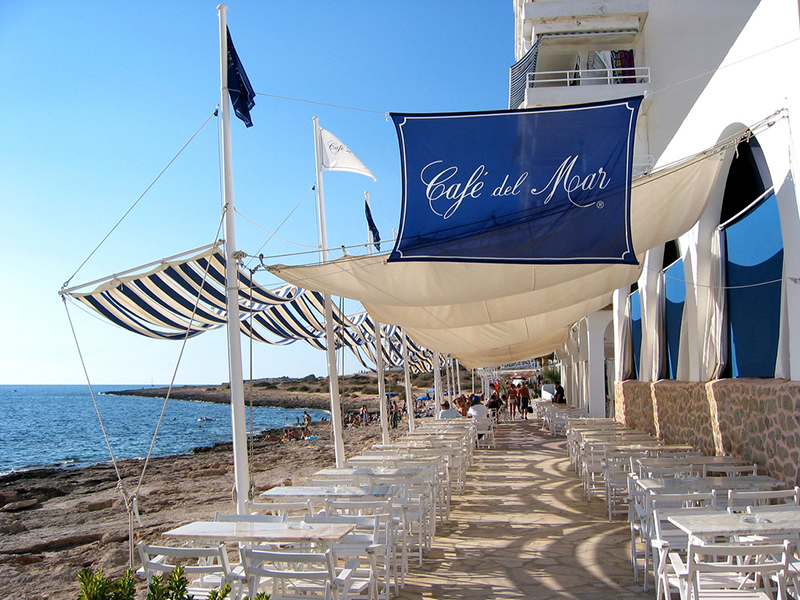 Located on the San Antonio Sunset Strip, Cafe Del Mar is one of the most famous bars/restaurants in Ibiza. Known for its spectacular sunset view and famous clientele, offering flavoursome food to accompany your sunset experience. Remember to get down early though as tables are first come first serve with a minimum spend Per Person for the sunset hours. Right on the main promenade of the main beach area, S’Arenal de San Antonio. 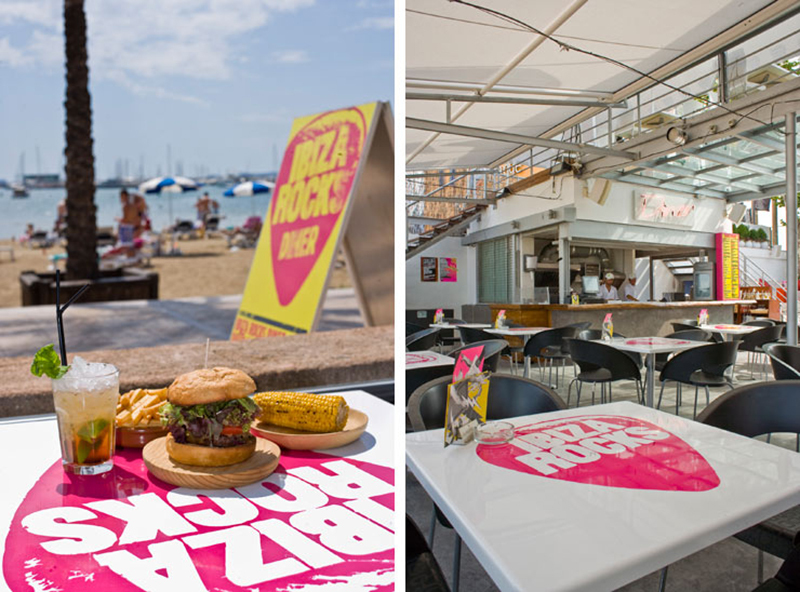 Ibiza Rocks is perfect for both a meal or drinks. Try the baby back ribs in sticky Jacks Daniels glaze or the chicken pitta to recover from that day of drinking. This chilled vibe bar is perfect for a midday cocktail or two, with its funky interior and hammocks outside to laze about in the 30°C heat. Check out the 6 euro Tulp house cocktail to cool down after a day at the beach. 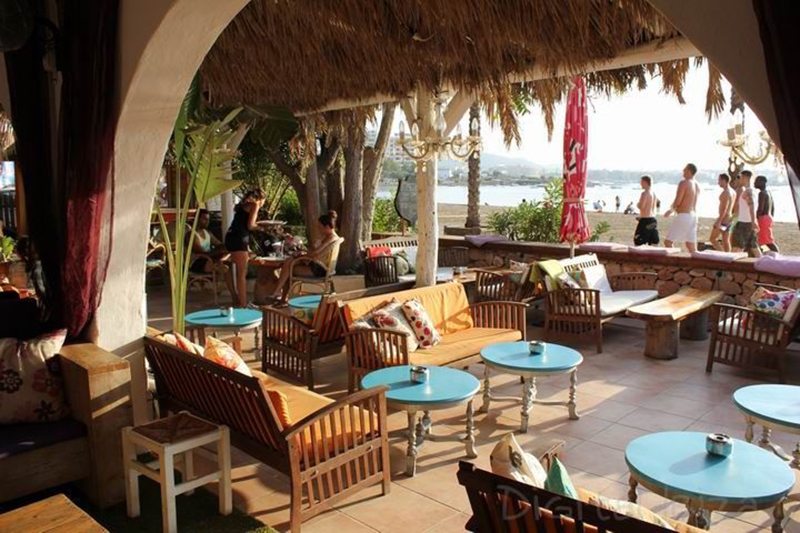 This bar sits directly behind the beach of Cala des Moro, serving ice cold beer for 3 Euros a pint and a delicious menu of a select tapas, this beach side bar is a perfect choice for a change of scenery. The main attraction has to be the huge sofas, where customers can sunbathe all day or simply chill out with friends in the shaded areas. The Golden Buddha is surprisingly quiet, which makes a visit there even more enjoyable, especially when combined with the small beach and beautiful views on its doorstep. 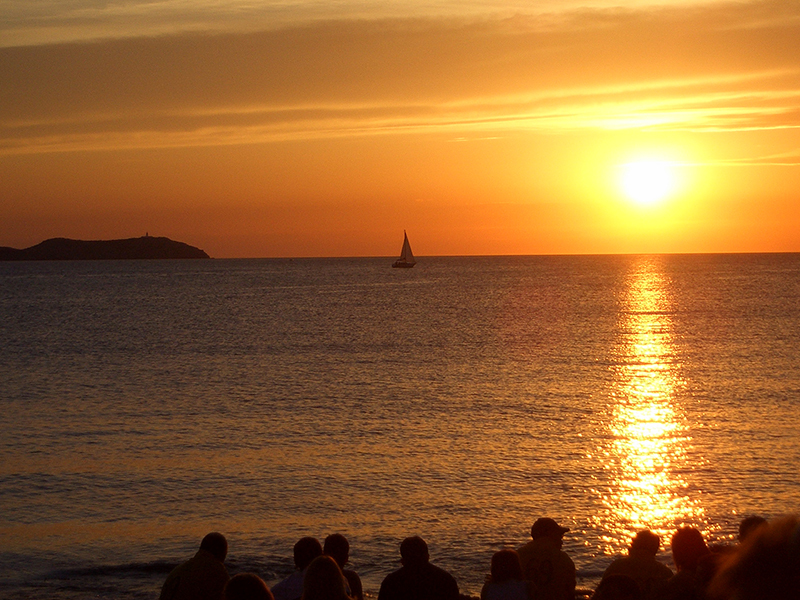 For such a small Island, Ibiza has so much to offer when it comes to Nightlife. Unfortunately we can’t fit it all on one page so check out our Ibiza Clubbing Guide here. There are plenty of car hire options both at the airport and in all the major resorts. Unfortunately it should be noted that Spain has one of Europe's worst accident rate records, so driving caution and extra insurance coverage are advisable. The minimum age for car hire ranges between 21-25 years. Available taxis can be identified by a green light and charge on a metering system. Taxis can be picked up at all the major clubs and bars in Ibiza. Mopeds and motorbikes are available for hire in all the major resorts and is a good option for getting to some of the more out-of-the-way beaches. Over 16s can rent a machine of less than 49cc whilst for anything over 75cc you must be 18 or over. Motorbike helmets are compulsory. There is a shuttle service from the airport to many of the major resorts. In addition, the bus service on the island is fairly modern and there are several different routes. 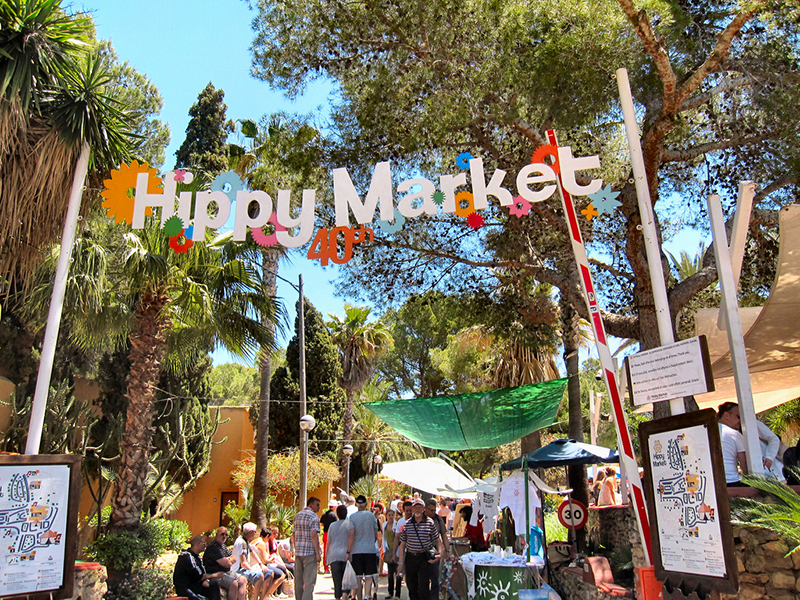 In Ibiza Town the bus station is located just a few blocks from the marina. You have to buy your ticket before entering the bus and there is an office selling tickets on the same street. In the evening, however, you can buy your ticket on the bus as the office is closed. Buses run every 15-30 minutes depending on time of day and route. From June until September, Discobus operates a night bus service stopping at all the major clubs and hotels around the Island. -Ibiza can be massively expensive for club tickets to the super clubs, so we would always advise to book your main tickets in advance and if possible pre-sale or on the day off the event in and around playa d'en bossa/San Antonio area you will find PR Reps for the clubs giving cheap entry wrist bands. 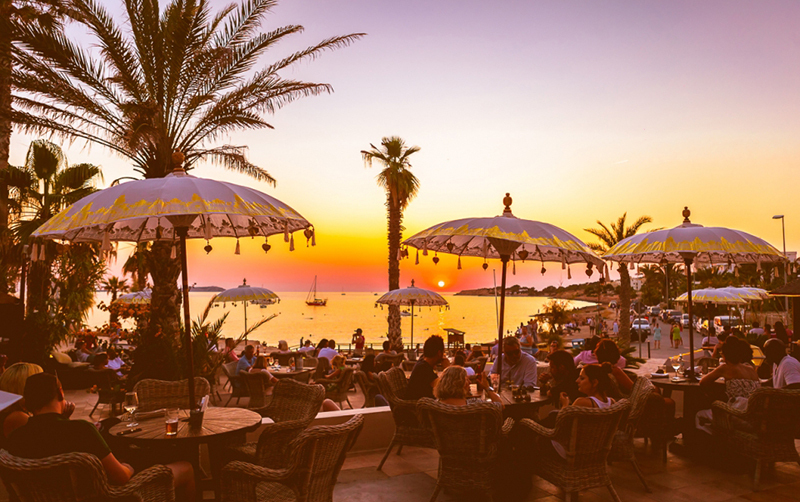 -The best money conscious way to see the beautiful Ibiza sun-set is to head to the sunset strip with some beers and chill on the rocks beside Cafe Mambo. -Drinks can be extremely expensive in the supper clubs so drink before you arrive at the supper clubs to save that extra bit of money. - The main clubs open at 00:00 and most people arrive around 1:30-03:00 so if you don’t have ticket the best time is just before 1:30am. -If your getting the disco buses to the clubs be sure to have your drink in a plastic bottle as glass bottles are not allowed on the buses. -Don’t drink the tap water- not in bars, not in clubs or hotels. The local supermarkets are the best place to stock up on bottled water at a reasonably cheap price to stay hydrated. -Check clubbing flyers for fine-print offers of discounted taxis as at some parties the promoter will refund the cost of a taxi if there are three or more clients paying full-priced door entry. You’ll need to present the taxi receipt at the door to receive the rebate.